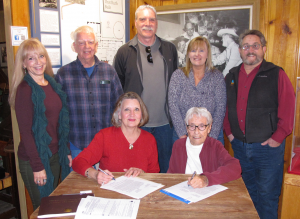 Sedona Historical Society Board members (L to R) Shondra Jepperson, Terry Greene, Larry Clemson, Lisa Hyatt and Al Comello with (seated) Board President Janeen Trevillyan and donor Martha Loy during the Schuerman homestead house donation ceremony. 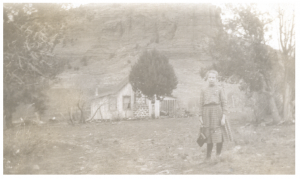 Sedona AZ – The Sedona Historical Society recently accepted a gift of a significant local historic building, the Schuerman homestead house, with the intent of longterm preservation. Pioneer Schuerman family granddaughter, Martha Loy, was raised in the house and made the donation. The home is the last remaining intact house built by a Sedona “first family” that went on to be used to successfully meet the requirements of the Homestead Act. 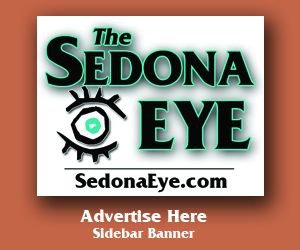 The Sedona Historical Society will be working immediately to make emergency repairs to the historic structure to protect it. The unique history of the property is tied to the story of Heinrich (Henry) Schuerman, who took title to a 160-acre parcel along Oak Creek in payment for a debt. After marrying in 1884, Henry and his bride Dorette moved to the land from Prescott to improve the place and sell it to get their money back. The extremely remote location made it all but “worthless” so the couple stayed, planting orchards and vineyards. The Schuerman homestead house ca. 1908 with Frieda Schuerman on her way to school. When the Schuermans decided to add to their land holdings, they filed a claim on property adjoining their existing ranch and built a homestead house. The growing family worked their orchards and vineyards on both their properties and spent the nights in the homestead house. The Schuermans were one of the earliest families to settle along Oak Creek and were prominent contributors to their new community. They built the first school in the area in 1891, and established the first cemetery. Henry served as a Yavapai County Justice of the Peace, served on the local school board, worked building local roads, was a member of the Masons in Jerome, and the family home served as an informal postal drop for neighbors. Schuerman produce was sold in Jerome, Prescott, Flagstaff, Clarkdale and beyond. Grapes from their extensive vineyards were made into juice and wine. The wine was sold to Jerome miners, local cowboys and neighbors. When Prohibition came to Arizona, Mr. Schuerman was sentenced to jail for selling his wine, but was eventually pardoned by the governor. After the Schuermans took patent to their homestead in 1913, they moved back to the big house on their first property. Daughter Frieda and her husband, Myron Loy, moved permanently into the house about 1928. 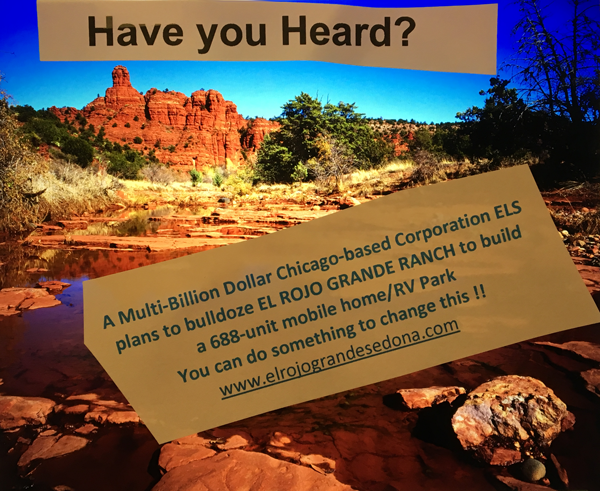 The Sedona Historical Society’s mission is to “research, preserve and teach the history of the greater Sedona area” and operates the Sedona Heritage Museum at 735 Jordan Road, uptown Sedona. For more information about the Schuerman Homestead House project, call 928-282-7038.